"This is my daughter's favorite egg dish. It has less fat, salt, and calories, but all the taste of the original version. Instructions are easy enough for my beginning cook to make on her own with minimal supervision." Preheat oven to 325 degrees F (165 degrees C). Prepare a 13x9-inch baking dish with cooking spray. Put an oven rack in the middle tier of the oven. Beat eggs, half-and-half, and black pepper together in a bowl until smooth. Arrange 6 bread slices into the bottom of the prepared baking dish. Spread about half the ham and half the spinach over the bread. Sprinkle half the green onions and half the Cheddar cheese over the ham and spinach. 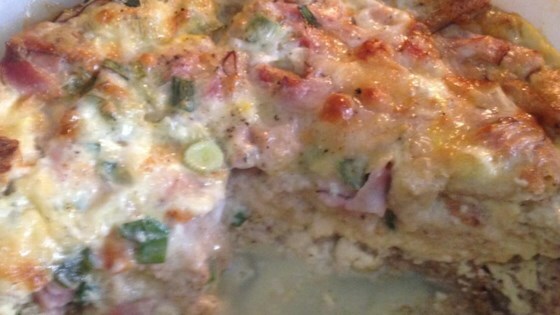 Spread the bread cubes over the layers and pour 1 cup of the egg mixture over everything. Repeat layering of ham, spinach, green onions, and Cheddar cheese and pour remaining egg mixture over the top. Cover dish with plastic wrap. Put some soup cans atop the plastic wrap to help keep ingredients immersed in liquid; refrigerate at least 15 minutes. Bake in preheated oven until the liquid sets in the middle of the dish, about 50 minutes. An instant-read thermometer inserted into the center should read 155 degrees F (68 degrees C). Let the casserole stand for 8 to 10 minutes before serving. This simple make-ahead breakfast strata stars sausage and Cheddar. Replace the ham with cooked, crumbled turkey sausage for a delicious variation on this dish.